Stanford University scientists have described a new type of test that can detect genetic mutations in minute amounts of DNA released from cancer cells into the blood. The test, which is called single color digital PCR, requires only a fraction of a tube of blood and can detect as few as three mutation-bearing molecules in a single reaction. According to the report in The Journal of Molecular Diagnostics, this highly sensitive test has the potential to be personalized to recognize mutations unique to any individual cancer. “For monitoring patient tumors, only a handful of blood tests are available which are limited to only several types of cancers. Nearly all cancer patients require monitoring by whole body imaging, which can be costly, complex, and time-consuming. In contrast, molecular tests like the one we have developed will enable patients to be monitored at every visit, and thus have the potential for quickly tracking cancer growth and spread. Moreover, the test’s rapid turnaround and relatively low cost, especially compared to next-generation DNA sequencing, provide a potential opportunity for universal monitoring of more patients than is currently done,” explained lead investigator Hanlee P. Ji, MD, Associate Professor in the Department of Medicine at Stanford University and Senior Associate Director of the Stanford Genome Technology Center. The report describes the use of the test to analyze samples from six patients. Five patients were previously diagnosed with colorectal cancer and one with cholangiocarcinoma. After generation of customized mutation detection assays, the researchers were able to identify tumor-derived circulating DNA from three out of six patients. In one patient, the assay was able to show the presence of three different mutations. The three patients, whose samples did not show elevated cancer DNA, were undergoing active treatment at the time of collection. This figure illustrates how the assay can be used clinically. 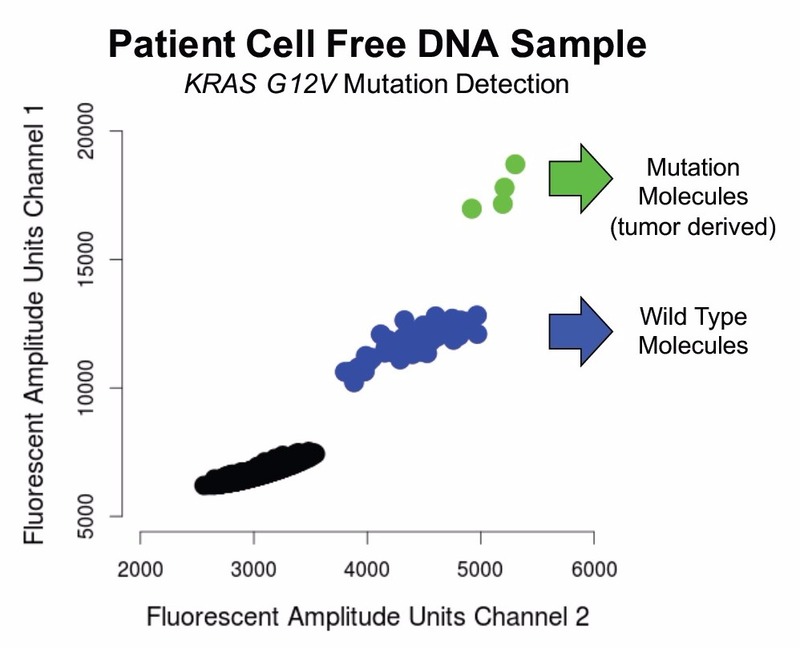 In this patient, the data enabled the investigators to count the number of DNA molecules containing the KRAS G12V mutation and, therefore, count the number of molecules that came from the patient’s tumor. The green dots represent molecules found to contain the mutation sequence, and the blue dots represent wild-type normal DNA molecules. The information was derived from less than a nanogram of cell-free DNA. The single-color digital PCR test offers several advantages over other methods of circulating tumor DNA analysis, compared to next-generation targeted sequencing and fluorescent probe–based digital PCR assays. The main advantage is that the new technique does not rely on pre-amplification, which can introduce errors and biases. “This test is simple enough to set up and analyze without extensive training, and therefore, it can be implemented by anyone, making it highly accessible to any laboratory. It has been truly motivating to work with a technology that will help transform the way that we monitor and treat individuals with cancer. I am excited to share our findings with the cancer research community,” noted lead author and researcher Christina Wood Bouwens, of the Stanford Genome Technology Center and the Division of Oncology, Department of Medicine, Stanford University School of Medicine, Stanford, California. The article is “Single-Color Digital PCR Provides High-Performance Detection of Cancer Mutations from Circulating DNA,” by Christina Wood-Bouwens, Billy T. Lau, Christine M. Handy, HoJoon Lee, and Hanlee P. Ji (http://dx.doi.org/10.1016/j.jmoldx.2017.05.003). It will appear in The Journal of Molecular Diagnostics, volume 19, issue 5 (September 2017) published by Elsevier as an open access article. Full text of this study is available to credentialed journalists upon request; contact Eileen Leahy at +1 732-238-3628 or jmdmedia@elsevier.com. Journalists wishing to reach the authors should contact Hanlee P. Ji, MD, Division of Oncology, Department of Medicine – Stanford University School of Medicine, at genomics_ji@stanford.edu. This work was supported by the NIH’s National Human Genome Research Institute and the Clayville Foundation. The Journal of Molecular Diagnostics, the official publication of the Association for Molecular Pathology, co-owned by the American Society for Investigative Pathology, and published by Elsevier, Inc., seeks to publish high quality original papers on scientific advances in the translation and validation of molecular discoveries in medicine into the clinical diagnostic setting, and the description and application of technological advances in the field of molecular diagnostic medicine. The editors welcome review articles that contain: novel discoveries or clinicopathologic correlations, including studies in oncology, infectious diseases, inherited diseases, predisposition to disease, or the description of polymorphisms linked to disease states or normal variations; the application of diagnostic methodologies in clinical trials; or the development of new or improved molecular methods for diagnosis or monitoring of disease or disease predisposition.